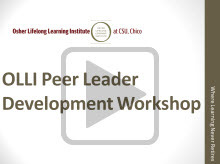 The Peer Leader Development Workshop was taped before a live audience on Saturday, October 13, in Colusa Hall on the CSU, Chico campus. The focus of the workshop is to provide information to members of the Osher Lifelong Learning Institute (OLLI) who are considering leading a class for the first time. 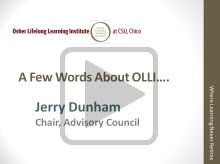 This is the first workshop of its kind for OLLI at CSU, Chico. It is designed to offer support for those considering a leadership role and features a new mentorship program, where new peer leaders are paired with a mentor or sponsor who can guide them in developing their course proposal and assist in determining appropriate format for each class. Complete Workshop: 1 hour, 13 min. So You Want to Be a Peer Leader? For more information on how you can lead a class for OLLI at CSU, Chico, please contact Program Director, Ann Nikolai, at (530) 898-5858 or email anikolai @ csuchico.edu.